But working raises the question of how do I fit work and home in one planner? I don't. Not really, anyway. 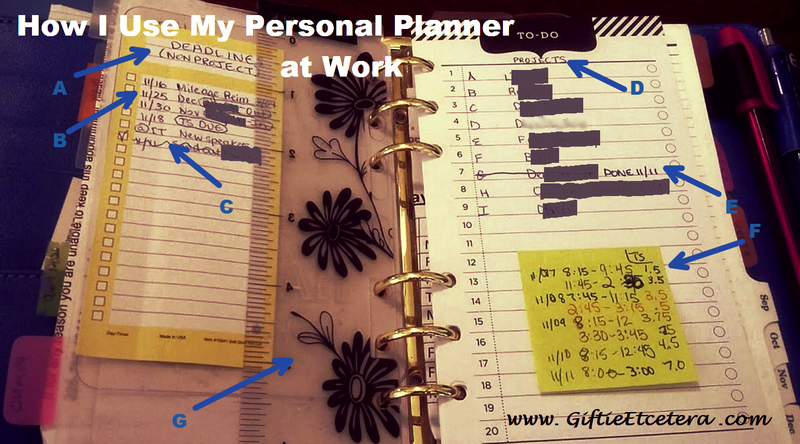 My planner plans my whole life, but I want work 1) to stay at the office as much as possible and 2) to stay confidential since I'm a lawyer keeping my client's confidences. So I've created a one-page spread to keep my work life organized in my planner. I'll explain my work planner spread one part at a time. It's important to have deadlines in a planner even on non-work days. If I am sick or need to schedule time off, knowing what is due is essential. Only hard deadlines go on this list. The deadline list is broken down into two components: DUE and Pending. Due dates are hard deadlines (meaning they are not easily missed without consequences). Pending items are items that are due from someone else, due after someone else does their part, or due after a certain date. Note that I mark when or who the items are waiting on. Having a list of current projects is important when I am away from the office. That way, I can visualize what I am up to at work and worry less about what I might be forgetting. I simply scratch out and date completed projects. Because I can work from home or remotely, I have to keep up with my time outside of the office. Appointments go directly on my personal calendar. Otherwise, I'd double book. Next time I blog, I'll tell you what work stuff is not in my planner - and how I organize it. I've missed your posts, but I'm glad your work done! Hopefully life will slow down a little bit and you can blog some more. I hope the rest of the family is doing well. I've missed your posts, too. :) I do something similar with school/home. I keep most of our school schedule separate, but block out time set aside for school and include things with deadlines, etc. I tend to be visual, and I can remember that I have something, but still plan another thing for the same time unless I'm looking at it.